The perfect addition to window boxes and patio containers, there's a place for them in any garden. A native of South Africa, geraniums are incredibly drought tolerant, easy to grow and low maintenance - a must for every garden! Zonal Geraniums (or Pelargoniums) are among the very best plants for containers and make a great border display too. Providing good height and incredible colour impact to your summer displays, they bring interest to beds and borders as well as making a perfect centrepiece for baskets and patio containers. Zonals are so named because of the burgundy-coloured half-moon pattern that develops on the upper surface of their leaves, however, it is the strong lollipop-shaped flowers that deservedly capture your attention. Each flower head of Big Ezee contains literally dozens of individual, bright red flowers together making a display that will last and last. They are incredibly strong-growing and vigorous, flowering throughout the whole of the summer months and right through until the autumn. 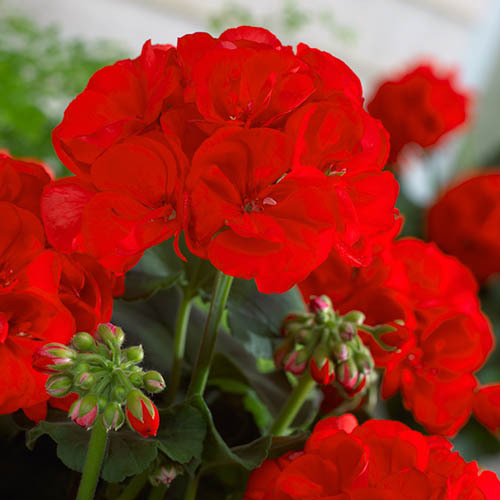 A native of South Africa, geraniums are also incredibly drought tolerant, thriving in any sun-baked container or a sunny bed or border in your garden. Easy to grow and low maintenance - a must for every garden! Supplied as 12 plug plants, ready for potting up and planting out when all risk of frost has passed. Supplied as a collection of 12 plug plants for potting up and growing on before planting out after all risk of frost has passed. Deadhead regularly to encourage more flowers. For maximum flowers, plant where they'll get at least 4-6 hours of sun a day.